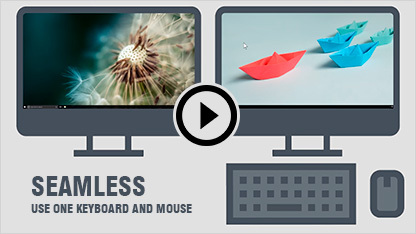 Control up to nine computers with a single keyboard and mouse, and seamlessly move files from one computer to another. Multiplicity uses the PC network or a VPN connection to enable your local PC to control remote PCs. The remote PCs are not required to have an attached monitor, keyboard or mouse and can be virtual machines. Monitor remote PCs with active thumbnails so you know what they are doing at all times or set the thumbnails to hide when not needed. Multiplicity also supports wake-on-LAN for starting remote PCs when you are not present. Copy and paste any content between your PCs. Multiplicity even retains text formatting. Multiplicity also supports drag and drop (seamless) and copy/paste of files and folders between your machines for quick transfers. Large files like videos and images are transferred quickly between PCs. Centralize audio from all of your PCs to a single PC ensure you never miss an email, chat or stock price alert. This capability is perfect for financial asset trading environments and call centers.